The developers behind Aberdeenshire’s planned new town, Chapelton, have put sustainability at the top of the agenda with the appointment of advisors focused on finding low-carbon, affordable solutions for the utilities provision for the 8,000 home town. Elsick Development Company has appointed mechanical and electrical engineers RSP Consulting and utilities broker Inventa Partners to work together to develop a proposal for all utilities for the development, including water, gas, telecoms and electricity. The masterplan and detailed phase one application for Chapelton, which in the long-term includes up to 8,000 homes across seven neighbourhoods with schools, high streets, community and commercial space, will be considered by Aberdeenshire Council soon. Lord Southesk, director of EDC, said: “Chapelton is designed with sustainability in mind. The town is planned to discourage excessive car use by offering a pleasant pedestrian environment as well as ample amenities and job opportunities close to home. “The houses within Chapelton are also designed to lessen carbon emissions in line with current government policies. Early homes are designed to achieve carbon savings through use of efficient building materials. “When we reach a critical mass of homes, facilities such as a combined heat and power plant may enable residents to lower their utilities bills and achieve further carbon savings. Robert Dunn, partner at RSP, said: “Our role is to liaise with utilities companies and advise on sustainable utilities solutions, not just for heat and power but also for telecoms and water. We are currently looking at options for a non-fossil fuel heat source and putting together a plan for a district heating system – working closely with Inventa Partners to find a cost solution. Both Inventa and RSP have a strong track record. They recently worked together on Edinburgh’s St James Quarter, the proposed development from Henderson Global Investors to demolish the current St James Centre, New St Andrew’s House and multi-storey car park, in the centre of Edinburgh and build a new retail offer, homes, hotels, offices, cafés and restaurants. Both companies will work closely with project management consultancy Turner & Townsend. As plans for Chapelton, Scotland’s largest planned town, ten miles south of Aberdeen, move closer to reality, Elsick Development Company (EDC) has appointed Turner & Townsend to project manage the delivery of the first phase of housing. Phase 1a will see 802 units and a small high street built at Cairnhill, the first of seven neighbourhoods. This appointment follows Turner & Townsend’s Project Execution Proposals document, which investigated project delivery. Turner & Townsend’s team will now develop strategies for the infrastructure construction phase, which will see them working closely with housebuilders and utility providers. The leading global project management and construction consultancy will also manage the appointment of a suitable contractor for the infrastructure works and manage the construction phase. Speaking of the appointment Lord Southesk, director of EDC, said: “The appointment of Turner & Townsend is an exciting step in the progress of the plans for what will be a vibrant new urban settlement. With finance in place and the further information report submitted we are now firmly focused on the construction phase. “After significant consultation and planning we expect to be on site early next year. This will allow us to begin meeting Aberdeen’s significant need for high quality housing by 2014. Final plans were submitted to Aberdeenshire Council at the end of September. The Further Information Report (FIR) is the final stage in the development process and the developers are confident that councilors will be able to review the FIR in the next few months. For more information visit www.chapeltonofelsick.co.uk. Final plans have been submitted to Aberdeenshire Council today (Thursday 27 September) by developers behind Scotland’s largest planned new town, ten miles south of Aberdeen. 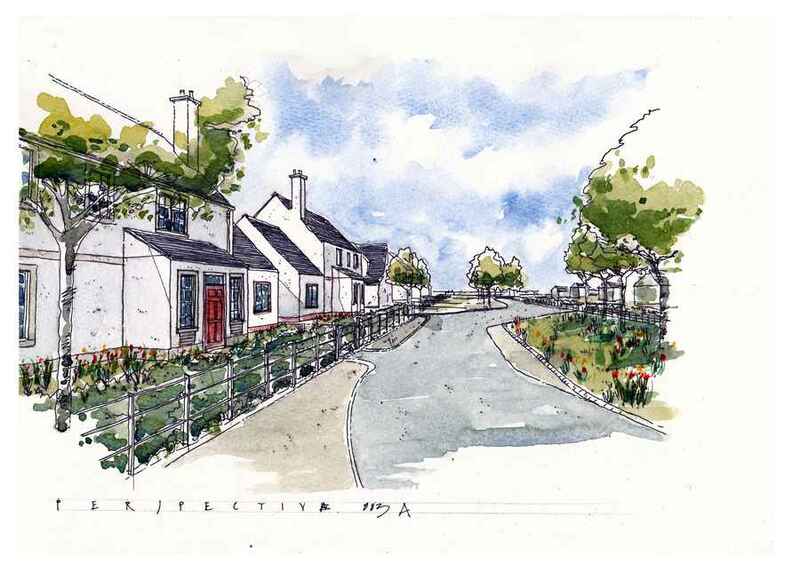 Following the initial planning submission in September 2011, the Elsick Development Company (EDC) has undertaken extensive consultation with the local community, statutory agencies and developers to refine the masterplan for Chapelton, in particular the detailed design for the first phase of the site incorporating 802 homes. This process has resulted in a number of amendments to the scheme and additional supporting technical, environmental and design information. The principle change to the masterplan concerns the design of the proposed junction at Bourtreebush. In response to feedback from local residents an underpass rather than an overpass has been recommended. • Public Transport – a mini bus link from the neighbourhood centre and a ‘park and choose’ facility will be built during the initial stages of the development. This is expected to be served by all existing bus services travelling along the A90. The FIR is the final stage in the development process and brings Scotland’s newest town a step closer. 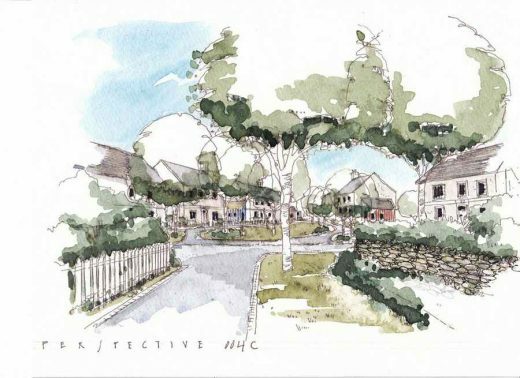 Chapelton recently received Council approval for the Development Framework and the first phase of the masterplan for the new 4,045 home community. Lord Southesk, director of EDC, said: “As part of the extensive consultation a number of important issues have been raised, which we have reviewed and worked hard to address. We have been very careful to ensure that the scheme and design refinements respect the concerns of those living within the surrounding area as well as the overarching vision for Chapelton: both are integral to building a new sustainable community for Scotland. Chapelton will include industrial and business development, within the site and on land adjacent to Newtonhill, and is estimated to generate approximately 8,000 jobs. The proposed town will offer a return to a community-based style of living which will provide a more pedestrian friendly, mixed-use environment for residents. From an extensive range of homes and schools through to a well-planned town centre and green space, developers aim to deliver a new sustainable community on a highly significant scale. The long term masterplan includes a total of seven neighbourhoods on the 2,000 acre site, creating the potential for 8,000 homes, which would make it Scotland’s largest new settlement for a generation. Construction of the first phase of the town is hoped to start in Spring 2013. For more information visit www.chapeltonofelsick.co.uk. Developers behind Scotland’s largest planned new town, south of Aberdeen, have announced important updates and unveiled new designs at a public exhibition held today (22 June 2012). Members of the public and local businesses attended the exhibition at Cookney Village Hall, to meet with the developers and to review the updated plans and designs for Chapelton. 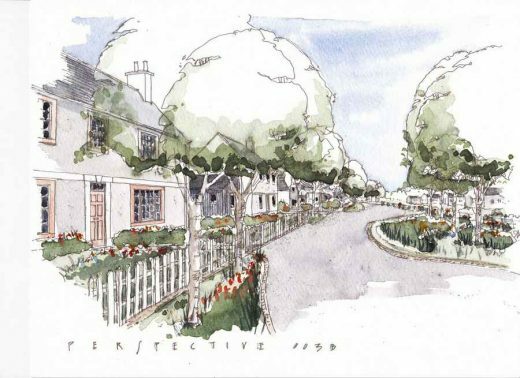 The Elsick Development Company (EDC) has conducted extensive community consultations, involving approximately 5,000 people including statutory agencies and developers, to refine the masterplan for Chapelton, in particular the detailed design for the first phase of the site. The exhibition follows the recent Council approval of the Development Framework and the first phase of the masterplan for the new 4,045 home community, 10 miles south of Aberdeen, which were lodged with Aberdeenshire Council in September last year along with detailed plans for the first phase of 802 homes. Lord Southesk, director of EDC, said: “We have been very encouraged with the comments and feedback that we have received as part of the consultation process; however, there have been several important issues which we have been asked to review over the last year and we have been working hard to address these concerns. This process has resulted in several amendments to the scheme and additional supporting technical, environmental and design information. Construction of the first phase of the town is expected to start in Spring 2013. For more information visit www.chapeltonofelsick.co.uk. Plans for Scotland’s new £1billion town have been given the green light by a Public Inquiry examining the Aberdeenshire Local Development Plan (LDP), which was carried out by the Government’s Directorate of Planning and Environmental Appeals (DPEA). The recommendations were approved by councillors at yesterday’s Kincardine & Mearns Area Committee meeting. Chapelton will play a major role within the LDP because of the project’s scale and vision over the next 11 years. Outline plans for the new 4,000 home community, 10 miles south of Aberdeen, were lodged with Aberdeenshire Council at the end of last year along with full plans for the first phase of 800 homes. Lord Southesk, director of the Elsick Development Company, said: “I am delighted that the Reporters have endorsed Aberdeenshire Council’s plan in respect of the allocation at Elsick and to do so in such positive terms is extremely gratifying. Chapelton will include industrial and business development within the site and on land adjacent to Newtonhill and is estimated to generate approximately 8,200 jobs. 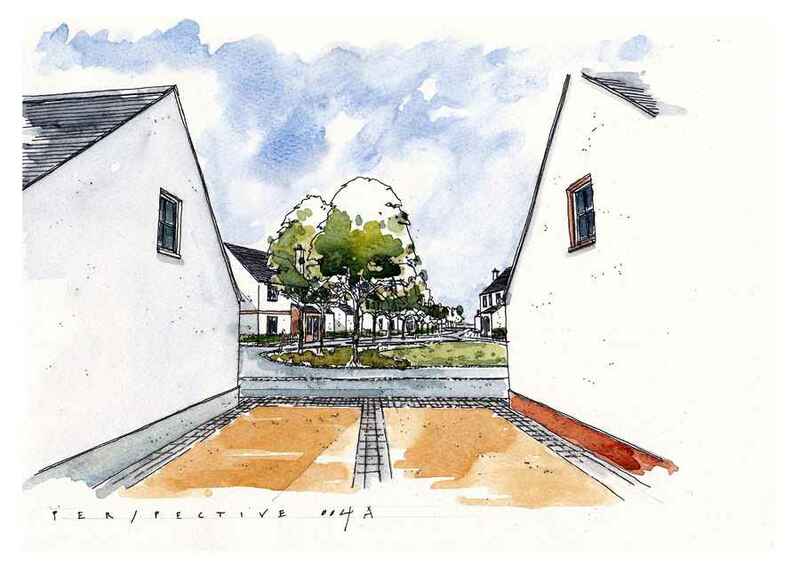 Striking new images of the Chapelton property types including lively street scenes have also been unveiled this week. The pictures demonstrate the new style of living that will be central to building a vibrant new community in the north east of Scotland. From an extensive range of homes and schools through to a well-planned town centre and green space, developers aim to deliver a new sustainable community on a highly significant scale. The long term masterplan includes a total of seven neighbourhoods on the 2,000 acre site, creating a potential for 8,000 homes eventually, which would make it Scotland’s largest new settlement for a generation. EDC has conducted extensive community consultations which have involved approximately 5000 people over the last two years. The process allowed the community to work with a world-class design team to develop the masterplan at a ten-day public charrette in 2010. The creation of Scotland’s new £1billion town has moved a step closer today (8 September 2011), with the submission of a planning application by Elsick Development Company (EDC). Outline plans for the new 4,000 home community10 miles south of Aberdeen, have been lodged with Aberdeenshire Council along with full plans for the first phase of 800 homes. The new town will also include industrial and business development on land adjacent to Newtonhill and is estimated to generate approximately 8,200 jobs. A long term masterplan for the new town has also been developed. A total of seven neighbourhoods on the 2,000 acre site will eventually be built creating a total of 9,000 homes, making it Scotland’s largest new settlement for a generation. Lord Southesk, director of the Elsick Development Company, said: “It has taken a great deal of work and commitment to get to this point. Transparency has been key to the development of the masterplan and will remain so if we receive permission. EDC has conducted extensive community consultations which have involved approximately 500 people over the last year. The process allowed the community to work with a world-class design team to develop the masterplan at a ten-day public charrette last year. The development company has undertaken further two public consultations since the start of the year to ensure that the members of the public have had a chance to provide feedback prior to submission of the planning documents. Many of the improvements to the masterplan have emerged in response to detailed technical and environmental requirements that the designers have been exploring since March. Changes include a revised road layout that fits with the topography of the site and a new biomass energy centre, which will enable Chapelton to be carbon neutral by 2016. The Council will now undertake a 28 day statutory consultation on the planning documentation where members of the public will be given another opportunity to comment on proposals. Aberdeenshire Council aims to adopt its Local Development Plan in December with planning applications determined in early 2012. If approval is granted, the Elsick Development Company hopes to start work on phase one, Cairnhill, in 2012. The masterplan was developed by Andres Duany, the global pioneer of new urbanism, a movement which builds walkable, mixed use towns with a focus on building communities around the world. 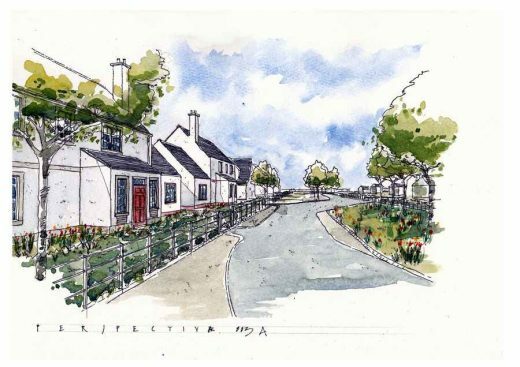 For more information re the Chapelton development and to view the new designs visit www.elsick.co.uk.